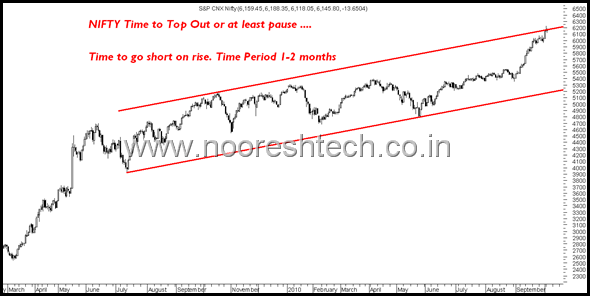 Time for Midcaps/SmallCaps to Outperform. Sensex is now around the higher end of the channel. 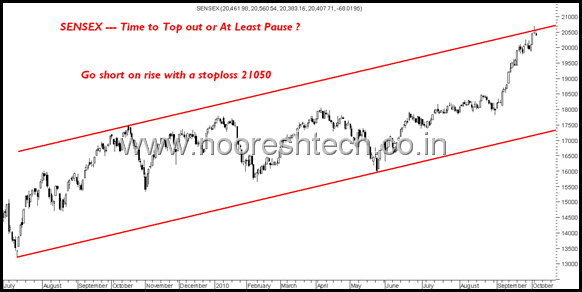 One can look to go short on every rise with a stoploss of 21050 on closing basis. Similar reasons for Nifty. Short on rise. As always the norm with markets Smallcaps/Midcaps start performing a little later after the index moves. In todays note to clients in morning had mentioned about the focus on midcaps and have recommended a few exciting smallcaps/midcaos. 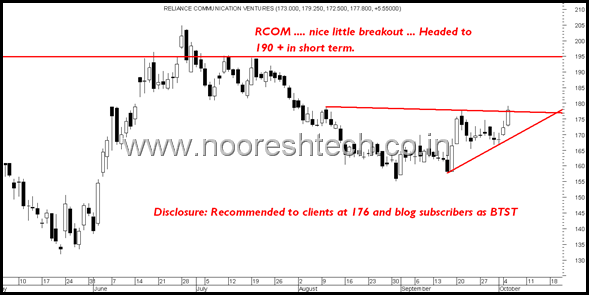 RCOM: Headed to 190 in short term possibly. BTST buy given at 176 to clients and free call to blog subscribers on SMS. 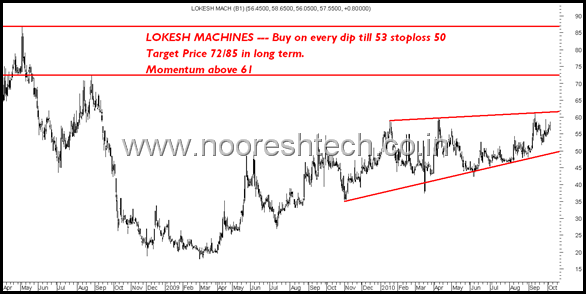 LOKESH MACHINES - Excelllent fundamentals and interesting technicals. Will test patience but reward over the next 6 months. Once the fundamental study is over might look into it as a small cap coverage. Quite a lot of small cap coverage is now only for clients like Hitech Plast - stock did 108 to 135 ! and still strong. Mudra Lifestyle has given a breakout and should head to 60 in short term. Reliance Capital earlier gave a breakout and then hit stoploss at 800 has now turned back. Can the stock head to 900 + quiite possible. 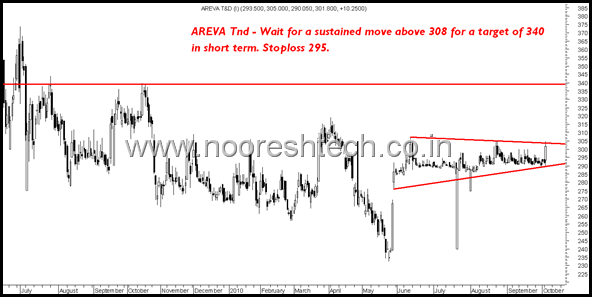 Watchout for a sustained move above 25.5-26 which will give a target of 30-32 in 1-2 weeks. HDIL and India Bull Real Estate look promising for 3-4 sessions swing trade. FINOLEX Inds buy above 112 stoploss 107 tgt 120-125 in 1 week. WESTERN INDIA SHIPYARD RECOMMENDED couple of days has given a breakout indication buy for a quick target of 18. Power Grid and Pipavav Shipyard recommended to readers who filled the pop up form should hold for the targets mentioned. If you want to get free advice mail to analyseindia@gmail.com with ur details. Those who would like to get our exclusive advisory services call Asif 09833666151 to help you out with the best combo packages and customized service. Breakout Stocks – Jain Irrigation , Reliance Capital, LIC Housing , HSIL. As ever Apprecite your calls, quick question, Andrew Yule what do you what us to do with this stock. Is it a hold? Also are you still bulish on hinduja Vent? Today I bought 2000 share of Sangam (I) @Rs.47 . Something is cooking . Can u give me the target technically. Please let me know if any change..
Any trgts for BL KASHYAP in short term. Sir, I have already informed you over telephone about my and my friend’s registation for Bangalore training course, hope you will be emailing the venue / time schedule by the weekend. I have purchased piramal glass @ 137 . May i know the target with stoploss and time frame . Is it right time to buy Orbit Corporation? Whats your view on tech mahindra? Is it a good buy? KOUTONS has decreased from 3oo to 13o from 23-o9 to o8-1o-1o. as fundamentaly copmany good so why prise is droped contiouslly. should i buy at this level. How come can you say the stock is fundamentally good. The buzz is pledged shares are being sold. many many happy returns of the day! !